Fusion Food That’s Not Fusion. But That’s Really Really Good. It’s fair to say I was somewhere near a retail center last Saturday when hunger pangs struck. Knowing it was National Margarita Day, a holiday that is less “time honored tradition” and more “spirit industry at work”, I ran down the list of mexican restaurants in the area. If you’re like me, you don’t need an excuse to lift a margarita but, still, the only restaurants I could think of were a) overpriced and b) probably overcrowded. It just wasn’t going to work out. Last year, I was lucky enough to get two tickets to the Houston Culinary Tour of Long Point Road with Chris Shepherd of Underbelly fame and Bryan Caswell of Reef fame as our tour guides. Let me just say that if you have never been on a Houston Culinary Tour, finish reading my blog and, only after you’ve finished reading my blog, click through to the site via the link love above. Run, do not walk to get tickets, because they usually sell out within minutes of going on sale, unless it’s the Vegetarian tour and then it doesn’t. Yes, the tours are just. that. good. I remembered a place the chefs mentioned on Gessner near Long Point called Vietnam Poblano, a random fusion of names from Vietnam (obvs) and the interior-Mexican city Poblano. I thought “what better to do on National Margarita Day than eat Vietnamese Mexican food”?! So I did. There are tens of thousands of hole-in-the-wall restaurants on Long Point. Adventurous foodies could spend weeks hitting the diverse, exciting and delicious restaurants along this stretch of Spring Branch north of I-10. The best part about these holes-in-the-wall is that they’re affordable — heck, I’d say they’re downright cheap! — so even if you stop at some taco truck or Korean barbecue house and hate your food, you’ll still probably only be out a ten spot. Vietnam Poblano is one of these places. It sits at the end of the Royal Oaks strip center next to Tony’s Multiservices and an empty parking lot. 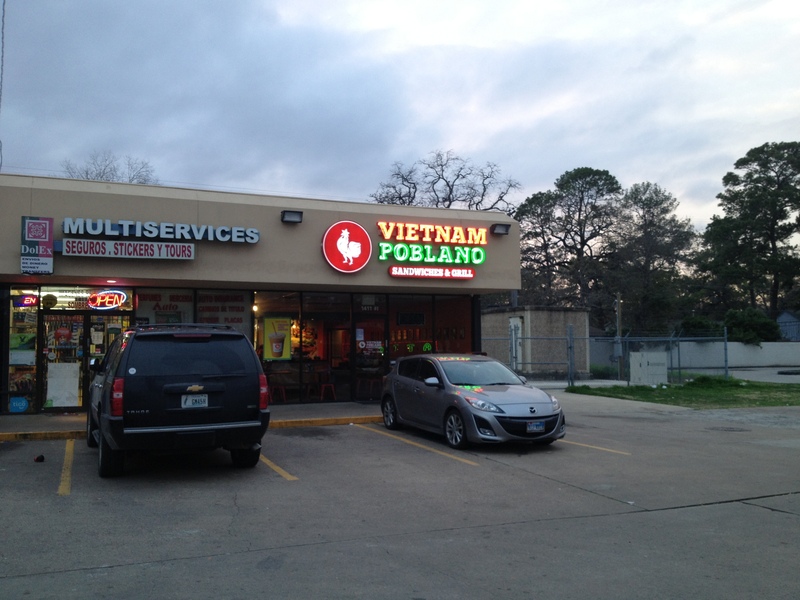 I fully expected to find some kind of viet-tex fusion1 but instead found a fairly typical Vietnamese sandwich shop. I asked what was good and the guy behind the counter told me they are known for their banh mi, a meat-filled sandwich on — you guessed it — banh mi, or french bread. Sidebar: Vietnam was a French colony for about 90 years and influenced the country not only in its cuisine, but in its religious beliefs, architecture, and broader social culture, as well. I ordered the BBQ pork banh mi (#1), the Gogi Beef fried rice (#10), Thai tea, and a delightfully-wrapped package of four tiny pastel macarons. I always over order when trying a new place so I can get the flavor of more than just one dish. I usually take at least half of everything home or, in the instance it’s really, really good, I don’t. The verdict of Vietnam Poblano? It was sublime. The BBQ pork was very thinly sliced with a hint of sweetness. I later learned this is because they add honey to their BBQ sauce. The sweetness of the honey partnered with the biting flavor of the fresh cilantro2 and deliciously pithy jalapenos on the crusty, fresh french bread nearly brought me to tears. I asked if they made their own bread and was told that they focus on the “guts” of their sandwiches and leave the bread baking to the bread bakers. Wise move, in my opinion — their meats and vegetables are cut in-house daily; they pickle their own vegetables; and their butter is made in-house daily, too. Without a doubt, it was the best banh mi I’ve ever had. 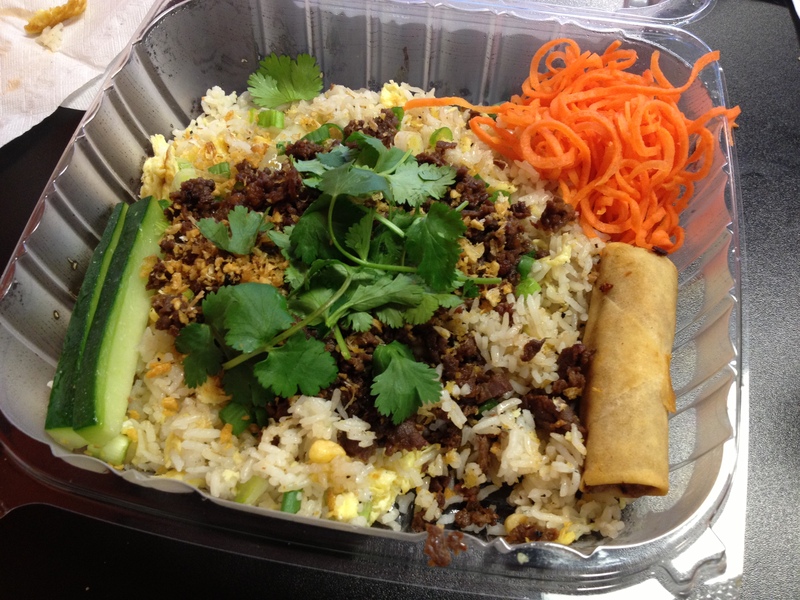 The Gogi Beef fried rice was very different but was delicious nonetheless. The meat had a smoky flavor to it and the fried rice was not greasy in any way. The dish was served with julienned pickled carrots into which I could have put my face. Like the banh mi, it was topped with a giant mound of fresh cilantro. They were outstanding and I was assured that they use only the finest of vinegars to pickle their veggies — you know, Heinz. Bottom line: soy sauce, so often needed to add flavor to bland fried rice was not required in any way, shape or form at Vietnam Poblano. It was also served with an egg roll, but it was flavorless and dry; clearly, the egg roll is not made in-house daily. My advice is to skip it and save your stomach space. Rounding out my dinner was Thai tea and the bag of baby macarons. They were good, but at $5.99 for four macarons the size of a quarter, I can do without. 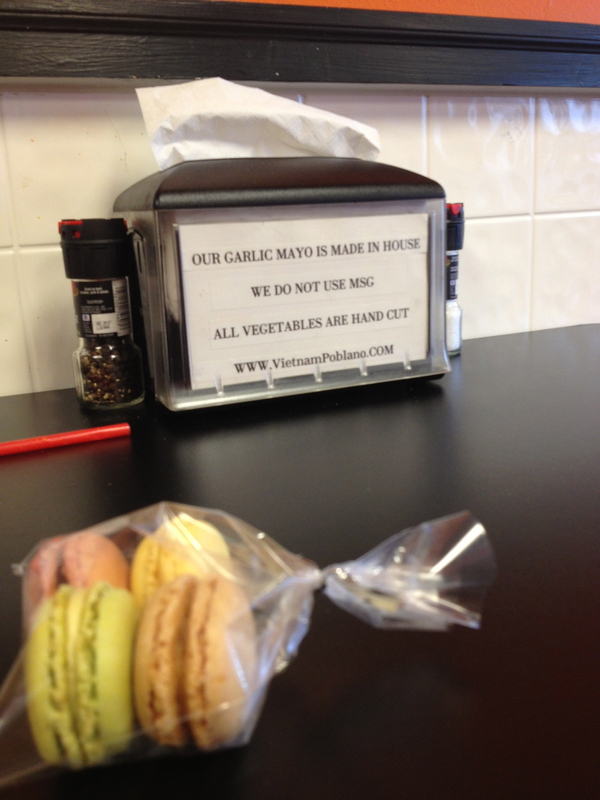 The service was great, the restaurant was clean and the prices (save the macarons) were very reasonable. 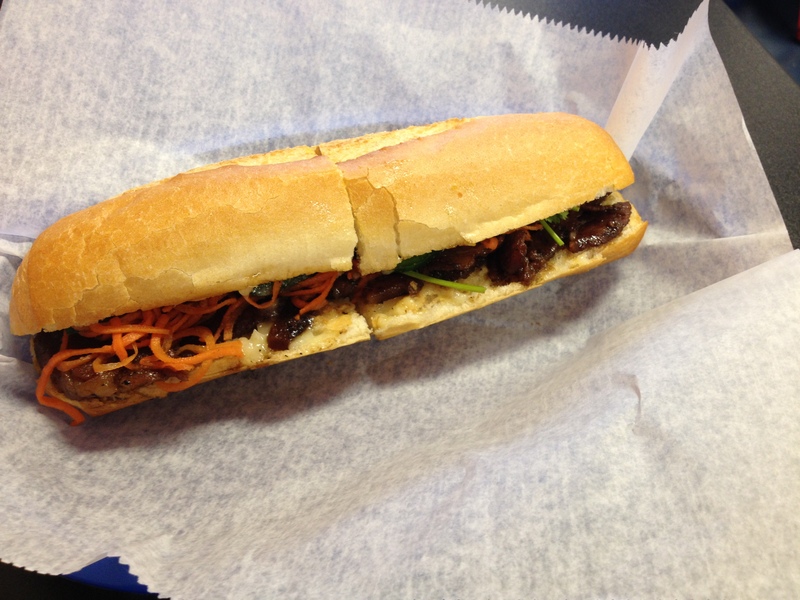 In fact, their daily special that includes a banh mi, a side and a drink is a mere $4.99. You can’t beat that with a stick. Like I said, even if you go and hate the food (which you won’t), you’ll still only be out a five spot. My suggestion? Run, do not walk, to Vietnam Poblano. I can’t wait to know what you think but I think you’re going to love it. 1The foodie word everybody has come to hate. Yours truly included. 2I love cilantro. I mean, I LOVE cilantro. I know that you either love it or you hate it, but I love it. The End.